Northern Oil and Gas (NYSE:NOG) is familiar to long-time readers of this blog. I posted about it here, here, here and here. I have been short this stock for some years and my view is that absent sustained high oil prices this company will file bankruptcy. 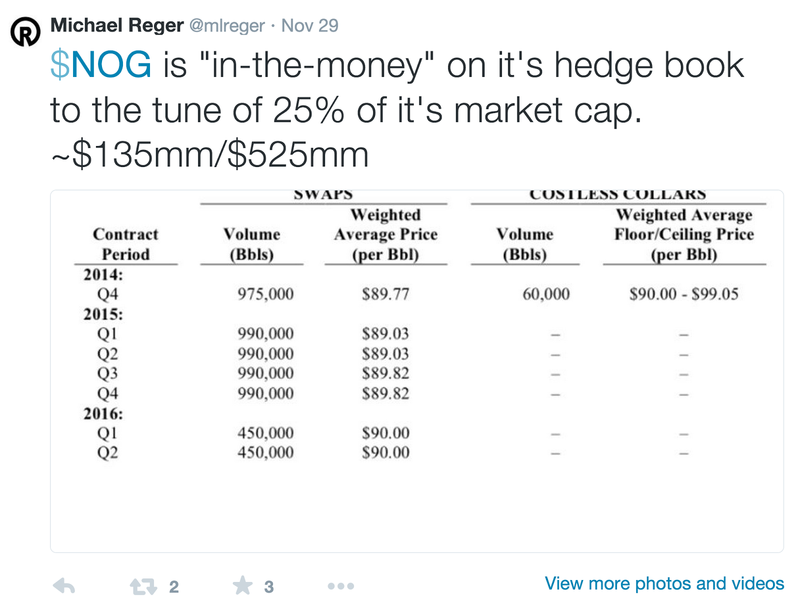 I also follow the Twitter account of Michael Reger - the company's CEO. In another tweet he says that "$NOG has the most capex flexibility in the Williston. Oh, and we're hedged at ~$90." Lets check this out. Northern Oil and Gas does have almost 6 million barrels of oil hedged at prices that are $20 in the money - roughly $120 million. This is against $736 million (at last balance sheet) of long term debt. The hedges are not in the money by 25 percent of market cap - well not really - because the debt holders have first claim. The hedges are in the money by less than 20 percent of the company's debt. The hedges will thus repay 20 percent of the company's debt. The company will need to pay the rest by itself from rapidly diminishing cash flows. Michael - please correct your tweet accordingly. Moreover Michael pleads capital flexibility. Even that is not obvious. The debt covenants require that the company has a current ratio of 1:1. Currently the company is not close to that covenant. The shortfall (more than 120 million) likely gets subtracted from the available line. Last quarter revenue was about $120 million. Revenue is likely to fall net of hedges. They have current accounts payable of $220 million. You may wonder how you possibly have accounts payable of almost twice quarterly revenue (and eight times cost of goods sold). I will let you work that out. John ... With respect, this is ridiculous. Congrats on making coin short. (care to post all of your covers and re- shorts) ? As for a NOG Bk, i would love to take the other side of that trade. Perhaps a 7 figure wager ? What's your time frame on that ! They seem to be on stable ground due to hedges for the entirety of 2015. Solid cash flow along a wide range of production and price possibilities, assuming an average 2015 price >70. Healthy coverage & room on the revolver even with a potentially likely 120mm draw. Factoring in a VERY aggressive 20% impairment to current proven reserves, ZERO new future reserves, and a 120,000,000 draw on the revolver they have a book value of 2.14, not zero as you seem to suggest these scenarios to imply. Should they choose to liquidate their swaps in order to meet the 1:1 covenant and pay down the payables, 66 dollar oil keeps them at 1.3x coverage on the senior notes and we have a book value of 4.08. I certainly can't argue your point that current management is for lack of a better term, sketchy. Per the picture (honestly pretty funny and I enjoyed your take) you painted back in your 2011 posts, they have a penchant for looking like idiots. Aside from this, they having shown that they can actually grow NOG a SIGNIFICANT amount since then. I would argue are proving your implied "management incompetence" thesis to be inaccurate. After all, it's not as if it is impossible to take defunct shell company and turn it into something (http://www.forbes.com/sites/nathanvardi/2014/12/01/the-king-of-online-gambling-is-34/). They could choose to do any number of things with a 120mm hedge gain! Pay down 120 mm of the 2020 notes trading at a nice discount and save a nice amount of interest, pay down some revolver, even keep it on! I don't know and I certainly have no idea where oil will be in 3, 6, or 12 months. I am wary of the capital structure and management, but at this price I am long and continue to believe that NOG is a solid investment/trade. Who knows, they could be massive frauds or oil could go to 20 and I would learn a very valuable lesson. Either way, I thank you for making a rational argument and putting it on a public forum for debate. That one's easy- recent capex is what will drive the bulk of their A/P balance. As rigs in the Bakken start getting laid down that number will shrink, quickly. The big risk for Northern is that, due to their status as a non-operator for their assets, they can't control their capex spend. If CLR or EOG decide to drill through the downturn, Northern will have to pay up or go non-consent on those leases (effectively losing the assets). If they lose enough lease value, and you can assume that any operators left drilling will be cherry picking the best leases, that will start shrinking their borrowing base even faster, reducing liquidity further, and continuing a vicious cycle where they lose control over their portfolio. At the point of maximum stress the operators can also pile on and start doing things like taking wells down for extended maintenance, front-loading costs to force additional non-consents from Northern, etc. It's a brave new world in the oil patch! Looks like the tweets are now gone, with a single neutral tweet in their place. As for the person anonymously offering the seven figure wager on bankruptcy - you can take that wager in the stock and bond market. I have. And you get better terms than anonymous is offering. "Anonymous at 3.09 is a smart cookie and worked out the order of events from here..."
Anon started out ok, but then went off the deep end. First, the borrowing base isn't derived from "lease value." Banks want production, not acres, so losing acres won't affect the borrowing base. Second, other operators aren't going to run around maliciously upping costs and shutting wells just to screw a 10% WI owner. Talk about cutting off your nose to spite your face! Sorry, but "Anon at 3:09" lost "smart cookie" status with those ridiculous remarks. "The hedges are not in the money by 25 percent of market cap - well not really - because the debt holders have first claim. The hedges will thus repay 20 percent of the company's debt. The company will need to pay the rest by itself from rapidly diminishing cash flows." Can you also provide some color on the rapidly diminishing cash flow comment? This is a poor attempt at points scoring John. The market cap is a known figure and the hedges can be valued (you say $120m). Saying one is 25% of the other is statement of fact. Often I might make the statement - "oh such-and-such is buying back 20% of market cap with their cash". Or "Tesco have 25% of their mkt cap in property". The debt holders' priority over the cash or property is trivially true - it just quantifies two numbers relative to each other. Welcome to April 24, 2017. The comments are great. John I hope you are smiling ear to ear. Cheers my friend for seeing the real picture.